It must be Christmas in February, because the new Volvo V60 wagon has been revealed ahead of its Feb. 21 debut and it looks stunning. The images were first leaked online by Bosnian site AutoMotoSvijet (which now seems to have taken its post down) and scooped up by Autocar. It looks like a shrunk down and un-lifted V90 Cross Country, which we’ve tested and liked immensely. 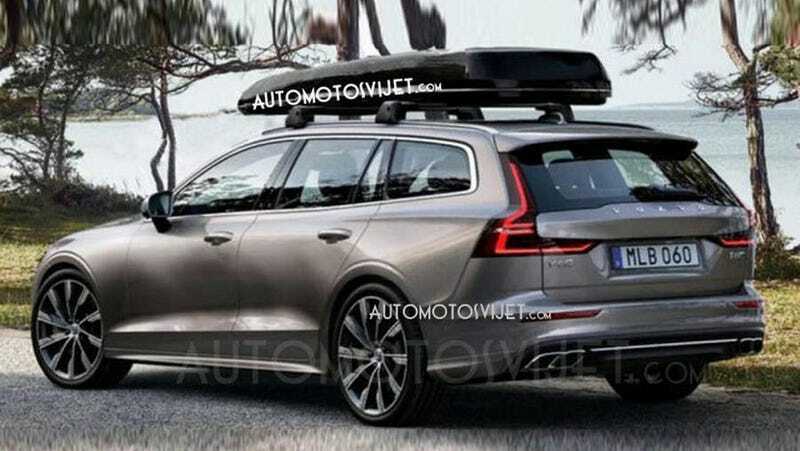 The V60 wagon will be offered alongside the new S60 sedan, which will be shown after the wagon and start selling in early 2019, Autocar reports. Most likely, the V60 will also be offered with Volvo’s T5 and T6 engines. And have those awesome Thor’s Hammer headlights. We can’t wait to check out its cargo hatch in particular; the biggest complaint about the outgoing V60 was that its hatch was too small. Hopefully the new one will be roomier. Anyway, here’s a small teaser video that Volvo uploaded earlier this week. You won’t get to see the whole car, but you get some nice detail closeups, so enjoy that.